Winter cloud s roll across the mountains and the air is rich with the smell of fynbos, still wet from the rains which have just passed over. The damp, sandy path we’re walking along is flecked here and there with dark, charcoal-stained earth. And far off in the distance the sea glistens from the few rays of sunlight managing to sneak through gaps in the laden sky. All around us are the unmistakable signs of the uniquely beautiful patch of Western Cape in which we live. All except for one – the alien in front of us. Or rather aliens, since the large enclosure we’re standing beside is home to not one but two magnificent Bengal Tigers – Raise and Arabella. Why they are here – why we are here, is the crux of this story. And of course how, in this oddly inter-connected world, they relate to my cycling. Yoli, Ben and I are visiting Panthera Africa in Stanford. The last time I was out this way was by bike on the Cape 600km Audax a couple of months back. Theunis and I rode almost past their front gate – also cold and wet, but on that occasion it was around 2am as we made our way to L’Aghulas. But that’s really just co-incidental, a much simpler and shorter route linked me with Panthera. Kim, one of the regulars on our Wednesday club social ride told us about the work she’d been doing with them. Her words and the name stuck with me and I liked their Facebook page when I got home. I didn’t do any more than that though for a number of weeks until a picture in one of their posts caught my eye. I’m not sure what exactly one expects of rescued big cats but pictures of them playing with enormous boxes wasn’t first in my mind. As we continue around the enclosures, we learn from our guide Martin, that “enrichment” is an important part of the work which their team of volunteers do. It seems what works to engage and stimulate domestic cats works for the 250kg cousins – only the boxes are much, much bigger. A central “activity enclosure” is also used in rotation to provide stimulation. As we approach it, three Caracals are chasing each other, crouching down lying in wait and then pouncing out. Apparently, it’s not just the range of exercise and toys in this enclosure which add variety to their lives but also the smell of the other cats that have been in their previously. I’m not going to steal all the thunder of the tour – it’s really best experienced first hand. Or better still, sign up as a volunteer and learn first hand what is involved in caring for these animals. There are a few facts though that will perhaps help emphasize the importance of the work being done here to rescue and provide proper living conditions for these amazing beasts. Captive bred cats are not released back into the wild – they never acquire the hunting and survival skills which would make this possible. Paying volunteers who believe they are helping rear cubs for release are sadly being misled. Their likely fate is to be breeding machines, if female, or “canned” prey for hunting if male. Add to the above the small and over-crowded pens, and poor feeding, and it becomes clear that the fate of captive bred animals such as these is a very sorry one indeed. And then you visit Stanford, and see Pardus – a stunning black leopard – hunched down in the long grass, yellow eyes fixed on you as she stalks your every move. Or hear Oliver or Obi huffing and puffing as they build up to a deafening baritone roar, which echoes off the surrounding hills and reaches far down the valley into the town itself. All of it watched quietly by the head of the pride from his adjacent enclosure. 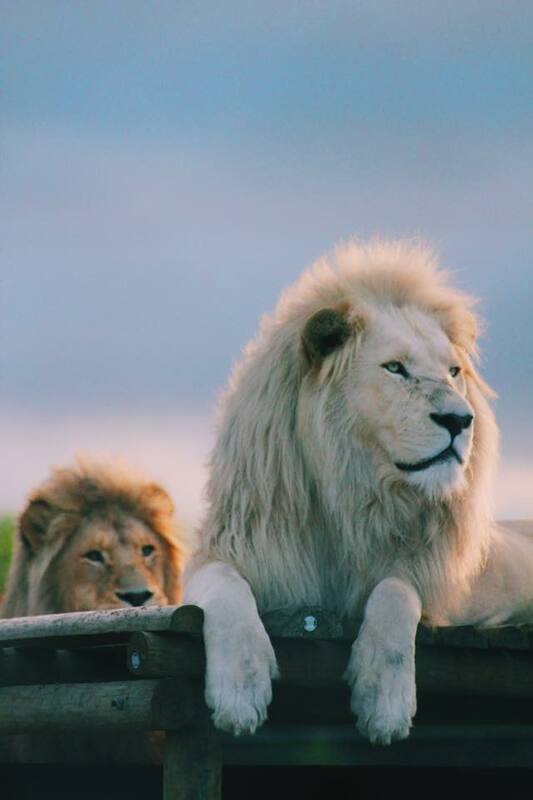 Neptune is a magnificent white lion, but he’s not in the mood for company today. One half raised eyelid is enough to tell Martin that we should move along and let him sleep in peace – curled up, looking for all the world like a contended house cat. Her gaze is far off in the distance, and the words are not spoken in reference to my upcoming Trans Continental Race. But they’re especially fitting all the same. Hopefully some of their strength and spirit will travel with me across Europe. If you’re stuck for a nice present for that distant aunt or uncle, checkout their web page of gift ideas. And if you’re the sort of person who likes to get involved and get their hands dirty, how about doing a stint as a volunteer for a truly unforgettable experience.